The History of Standup - . 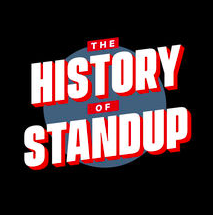 You should be listening to The History of Standup, a podcast from my friend Wayne Federman and his friend Andrew Steven. As it says in the podcast description, "Comedian Wayne Federman teaches Andrew Steven about the history of standup in a casual, conversational history class, looking over some of comedy’s most interesting moments. From Vaudeville to Netflix, we look back at the evolution of standup comedy." It's funny and fascinating and available on iTunes and what are you waiting for?